Researchers from the Wild Nature Institute enlist supercomputers to conduct one of the most ambitious large mammal studies ever undertaken. Giraffe numbers have declined precipitously across Africa due to habitat loss and illegal killing for meat, and to counter this trend, scientists are enlisting supercomputers. Project GIRAFFE. Researchers working in the Tarangire ecosystem are using supercomputers to identify and track giraffes in an effort to stem their declining numbers. Courtesy Wild Nature Institute. Using advanced computational methods to study the births, deaths, and movements of giraffes, Project GIRAFFE aims to reverse declining populations. Focusing their research across the 4,000-square kilometer Tarangire ecosystem, scientists comb through thousands of digital photographs. These photos show each giraffe’s unique and unchanging spots — patterns identifying individuals throughout their lives. Analyzing these photos is an exacting and time-consuming process, and each one must be manually cropped to show only a giraffe’s torso to the pattern recognition software. Microsoft scientists have helped automate the image processing through machine learning technology deployed on the Microsoft Azure cloud. 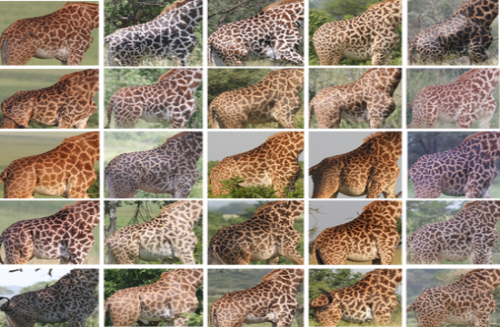 The Microsoft team uses a computer vision object detection algorithm, and has trained a program to recognize giraffe torsos from existing annotated giraffe photos. The program progresses via an Active Learning process: The system identifies new images and displays its predicted cropping squares to a human who quickly verifies or corrects the results, and then feeds these new images back into the training algorithm to further improve the program. To perform the millions of calculations required to match his giraffe photos, Lee received a grant from Microsoft Azure and their cloud computing service to build virtual supercomputers. The Azure virtual machines would be very expensive to build, but the computing power was rented from Microsoft Azure for the few weeks necessary to run a year’s batch of giraffe matching. Big data programs are often described by the three 'V’s' — Velocity, Volume, and Variety, and Project GIRAFFE is growing in all three. The variety of data streams is also increasing as WNI invites participation from village game scouts, tourism operators, and ecotourists on safari. Involving stakeholders is integral to monitoring how giraffes respond to community conservation zones known as Wildlife Management Areas. WNI partners at the PAMS Foundation are supporting intelligence-based anti-poaching activities to protect elephants and giraffes in the Tarangire ecosystem, and the institute is documenting how the wildlife populations respond to their efforts. Armed with data-driven conservation knowledge products, WNI scientists and partners are working to protect and connect the areas that are most important to giraffe survival and reproduction. Read Derek Lee's original blog entries about Project GIRAFFE here.